Hydroforming may allow automotive spaceframes to make a comeback. Last week we looked at how the hydroforming process can be used to shape intricate metal parts. This week we cover the fundamental changes to body design that can flow from that - spaceframes for mass-produced passenger cars. During the past nine years, general awareness of hydroforming has grown steadily. Although interest in tubular hydroforming is wide ranging, the vast majority of new high-volume applications are in the automotive industry. 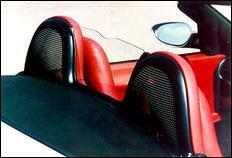 But the 'killer' application that allowed tubular hydroforming to become truly successful was the automotive chassis - the framework that holds together the basic parts of a car. While chassis designs vary, all are driven by the same fundamental design criteria - to provide maximum stiffness, dimensional stability, fatigue life, and crashworthiness with minimum mass and cost. Automotive chassis engineers embraced tubular hydroforming because it allowed them to make their designs more effective. Consequently, the demand for tubular hydroformed components has grown dramatically. 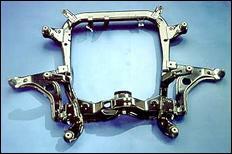 Historically, chassis structures were produced from assembled stampings. Assembly methods evolved from bolting and riveting to welding, but little else changed until 1994, when Ford Motor Company introduced the first tubular hydroformed engine cradle to the North American market in its Contour / Mystique models. The growth of tubular hydroforming in chassis systems during the past five years has been astounding. By some estimates, 50 percent of the vehicles produced in North America by the year 2004 will have chassis with hydroform content. So what is the next 'killer' application for tubular hydroforming? 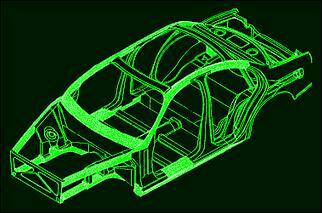 The answer to that could lie with a vehicle structure commonly referred to as the spaceframe. A spaceframe is a series of structural members assembled to create a skeletal system that supports the interior systems, as well as the exterior skin and drive line components of an automobile. 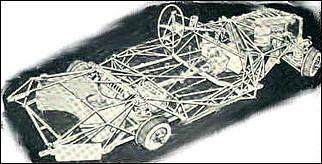 Spaceframe architecture has been around for a number of years (the pictured design is from a 300SLR Mercedes), but its use has been confined to ultra-low-volume, niche vehicles. Currently, the majority of mass-produced vehicles are built with either body-on-frame or unitised body architecture. The body-on-frame architecture predates the automotive industry itself and is still widely applied in the light truck, sport utility, and full-size luxury car markets. It involves a structural platform, commonly referred to as a ladder frame, tuned for desired structural performance, to which the driveline, suspension, and body subsystems are mounted. The body is typically floated above the platform on rubber pads to further improve isolation of the passenger compartment. The ladder frame is typically constructed of stamped welded members and is the primary load-carrying element in the vehicle system. Unitised body or unit-body vehicle architecture integrates the body and the frame so that only small engine cradles or structural crossmembers are required to distribute concentrated loads into the body system. The body itself is tuned to the desired structural performance and functions as the primary load-carrying element in the vehicle system. Corporate Average Fuel Economy (CAFE) regulations have put a tremendous strain on North American automotive producers. In an age when a gallon of gas costs less than a bottle of drinking water, the average consumer is unwilling to give up size, performance, or safety in favour of fuel economy. To meet CAFE regulations and contradictory customer expectations, engineers must develop more efficient power sources and lighter-weight vehicles. More demanding crash test standards and greater customer awareness of vehicle safety have challenged manufacturers to improve occupant safety without sacrificing fuel economy. Customer expectations for acceleration, ride, and handling are on the rise, as are speed limits. The average speed limit on US highways is 110 km/h. Like autobahn-inspired European designs, North American vehicles must get lighter and stiffer to keep pace with customer expectations for vehicle performance. It is common to hear of new vehicle platforms - that took four to six years to produce - rolling onto showroom floors to poor reviews and less-than-anticipated sales. Vehicle performance characteristics, styling, and projected market demand are established at the beginning of the development process. The longer it takes to get a vehicle from concept to production, the higher the risk customer expectations will change or unfavourable market conditions will evolve. To ensure success of future vehicle platforms, manufacturers are working to cut development cycles by 50 percent or more. To recap, manufacturers must develop more efficient, safer, faster, lighter, and stiffer vehicles in less than half the time it has taken in the past. Viewed in its entirety, this could be seen as a problem with no satisfactory solution. However, broken into its elements, there is hope. Spaceframe architecture is by no means the total answer. However, it likely will be a key element - a marked increase in spaceframe development activities is underway at most of the major car manufacturers. The United States Council for Automotive Research - Partnership for a New Generation Vehicle (USCAR - PNGV) - was launched to develop technologies necessary to support the next generation of fuel-efficient vehicles. Its members include General Motors, Ford, Daimler-Chrysler, and the US government. It is one of the many organizations around the world exploring spaceframe architecture. The group report a 50-percent weight reduction derived from a steel spaceframe design that promises lower manufacturing cost and lower investment than traditional architectures. Ultra Light Steel Auto Body (ULSAB) is a consortium of 35 steel producers who are united in an effort to develop a lightweight steel body system by combining high-strength steels and advanced manufacturing technologies. 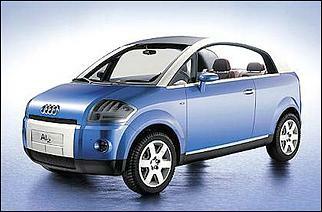 Its initial design direction was a hydroform-intensive space frame. However, the consortium opted for a conventional unitised body architecture to ensure credibility of its efforts in the eyes of mainstream manufacturers. Speaking at a recent hydroforming conference, Robert Koer of Porsche Engineering Services, engineering manager for the ULSAB project, said he believes that spaceframe architecture offers a viable alternative for lightweight steel autobodies. The United Kingdom-based Solvo 6 is a consortium of Rover, various automation and equipment producers, and the UK government that has joined together to develop flexible, low-cost automation for assembling space frame structures. Several universities and independent companies also are conducting research in this field. A tubular part, be it extruded aluminium or rolled steel, has a constant cross sectional shape that may be efficient and appropriate at one location on a part but inefficient and inappropriate at another. This design inflexibility, in many cases, yields a structure that is not fully optimised. 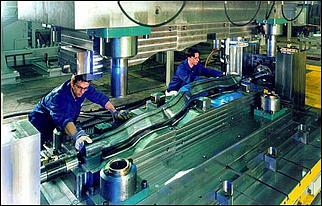 As dictated by the extrusion and tube rolling processes, tubular members are produced in straight lengths. To accommodate typical vehicle assembly processes, the straight tubular members often must be bent or reshaped. Common bending and reshaping processes induce part-to-part variation that exceeds what is typically acceptable for an automated assembly line. For extruded aluminium tube, dimensional instability inherent to the extrusion process alone can exceed what is typically acceptable for automated assembly processes. The inability to fully optimise the structure, the additional labour needed to overcome dimensional instability, increased rework, and higher scrap rates all drive manufacturing costs. Connecting other vehicle subsystems to the spaceframe can be cumbersome and costly as well. Niche vehicle producers can save money because their substantially lower investment for spaceframe structures offset the higher manufacturing cost. However, for a mass-produced vehicle, higher manufacturing costs can quickly overshadow investment savings. Spaceframe structures could not have bridged the gap between niche production and mass production without the resolution of these issues. Tubular hydroforming allows engineers to optimise their designs through cross sectional reshaping and perimeter expansion. It also can produce parts with greater dimensional stability than is required for automated assembly. These attributes, combined with the ability to inexpensively perforate holes required for vehicle subsystem interface, make hydroforming the enabling technology for spaceframe architecture in mass produced vehicles. This emerging trend is evident at Audi AG, which is preparing to launch its second-generation spaceframe on its AL2 platform. It goes into production this year at a volume of 70,000 annually, more than three times the volume of the first-generation A8 spaceframe. The AL2 is the first tubular spaceframe vehicle to jump the gap between niche and mass production. While the A8 model did not employ tubular hydroforming, the AL2 has 11 hydroformed components. 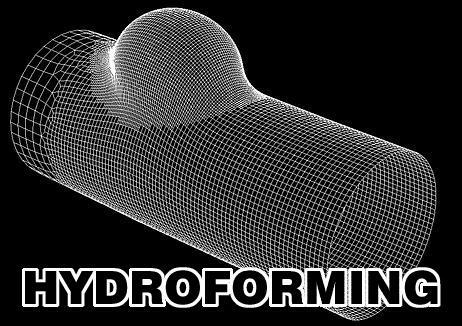 By some estimates the market potential for hydroforming in body systems is roughly three times that of chassis systems. If early signs are any indication, the demand for tubular hydroforming in body systems will drive the technology up another rung on the evolutionary ladder. *Richard A. Marando is Chief Engineer for hydroform development with Parish Division of Dana Corp. Parish manufactures automotive structural components, including frames, engine cradles, and components for body-in-white systems.